About us (Carmeltint.com) and our history in the Indianapolis Window Tinting Market are all detailed here on this page. Our beginning all started in the economic recovery year of 1986. Back then we were coming out of a recession that had lasted for about 8 years. Things had been very bad for the auto industry and the home market was even worse. Double digit interest rates were the order of the day and not many people were buying cars because of them. In April of '86 we were the FIRST in Indianapolis to offer a mobile service exclusively to new car dealerships - something no one had ever tried in Indianapolis. Our timing couldn't have been better. The first week of April, GM announced 2.9% financing all their new cars. Ford, Chrysler, and others followed suit. This kick started the automotive industry and the economic recovery was underway. 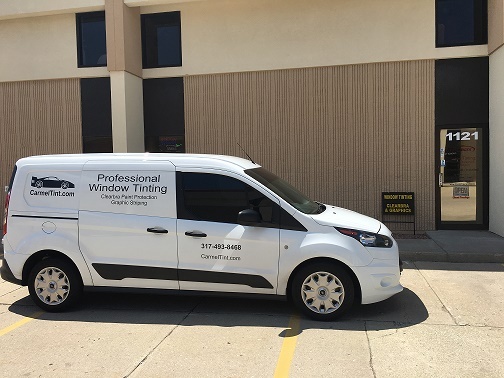 For 22 years we would travel around the Indianapolis area installing high quality window tinting on new cars prior to delivery to their new owners. The dealerships would provide us a location in the service department where we could pull the car in, measure and hand cut the window film, and then install the tinting. For the dealership, the customer, and us, this was a winning scenario. The sales staff would sell the car, offer to have window tinting installed for the buyer, pick up the phone and call us. Within a day or so, the car was delivered to the customer WITH new window tinting installed. The dealership was able to keep control of the car until delivered, and we offered them a discounted price for volume. Customer satisfaction was kept high and everyone was happy. As everyone knows, the economy was being held up by artificially inflating the Housing market. Sub-Prime lending practices and Credit Default Swaps between investment firms and banks led to the worst economic collapse since the Great Depression. Once people stopped buying new homes, they also stopped buying the things that went into their new homes. People stopped buying new cars and we were deeply impacted. All this inactivity combined to create the Great Recession. We almost didn't make it, like so many folks. Below is how we struggled to adapt. When the economy collapsed in September 2008, out of fear of the unknown, most dealerships stopped adding any accessories to their cars, forcing us to offer our services to the public. In the fall of 2009 we started to move away from dealerships by offering our services to the Indianapolis public. For the next couple of years we tried to keep our overhead down by traveling to the homes of our clients, offering our services directly at their homes. We did however pick up a couple of good dealership accounts. Saturn did not close until 2011 so we still had 3 of those dealerships. We also started doing business with a Ford dealership on Pendleton Pike. However, after about 18 months, the owner committed suicide forcing the widow to sell the dealership and close the store. Traveling to our clients' homes was an incredible convenience for them. However, this approach to our business presented many challenges to us. Traveling around put a lot of wear on our vehicle. High gas prices in the $4 to $5 range made it difficult to offer a high quality service at a competitive price. Our monthly fuel bill was upwards of $1000. Many times the client would assure us that there would be ample lighting, access to electricity, and space to get the car doors open. More often than not we would arrive to find none of those things available. If the first 2 Problems were not there, and there was access to water, everything was great! Until the weather turned cold. Winter weather made things so difficult that we nearly starved due to no work. Not ideal! Still, with all the down sides to this business model, we made it work for a while. In October of 2010, we were offered an opportunity to share a garage with Indy Auto Source. After about one year sharing this location, we realized it was time to get our own place. In April 2012 we said goodbye to Indy Auto Source, and moved to our current location at 1121 3rd Ave SW, in the Kirby Real Estate Park just west of the Monon Trail off Carmel Drive here in Carmel. Our new location came with a waiting and reception area, as well as a 1600 sf warehouse that is fully climate controlled and well lit. We believe this environment has contributed to our success as it insures us the ability to provide a clean installation. We are asked all the time why we don't promote a certain film brand over another like so much of our competition. The truth of the matter is that all manufactures make mistakes and have had film lines that fail. We have been in this industry for nearly 30 years and have used many brands over the years. We are always on the lookout for a better product that will enhance your experience and make you happy with your choice. We use only High Quality films from manufactures we have thoroughly researched and are confident will last long after you have sold your current vehicle.